My aim for the Series work is to try to explore one of the themes we have already worked, in more depth. I would like to use different techniques in each piece, while using one or two minor elements of the design throughout the pieces, to give some coherence to the whole series. I would like to use my original investigation and design work as a starting point, but to expand and enhance this, and for my own benefit I would like to try (again) to do much more sketchbook work than I have previously. (I am notoriously bad at skipping the sketching and sampling stages of design work in my enthusiasm and impatience to get on with the fabric and stitching). 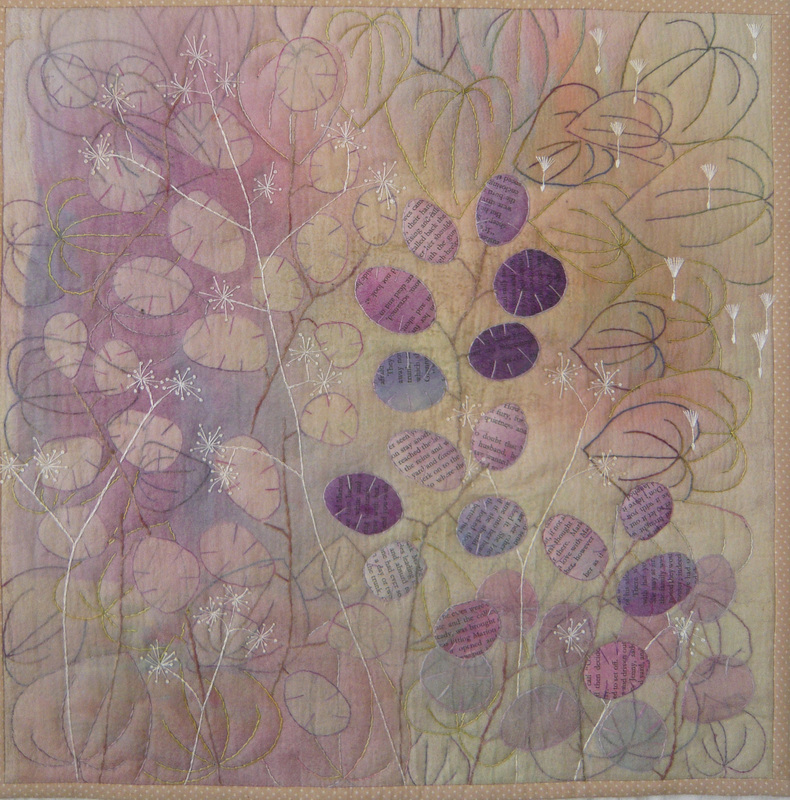 I decided to use my ‘Botanics’ quilt (Seed heads) as my theme for the series work, because I love the variety of different forms and shapes that seed heads can take. Some seed heads are delicate and almost ethereal, while some are solid and chunky, and yet more take the form of berries and fruits (which if you think of it, also contain seeds). All plants have seeds – ornamental flowers, humble wild flowers, grasses, and even trees – and all are distinct and different, so the subject really is wide. My original quilt was entitled ‘Seed Heads’, and is shown here – but I have started the series with a new quilt, and the details follow below. 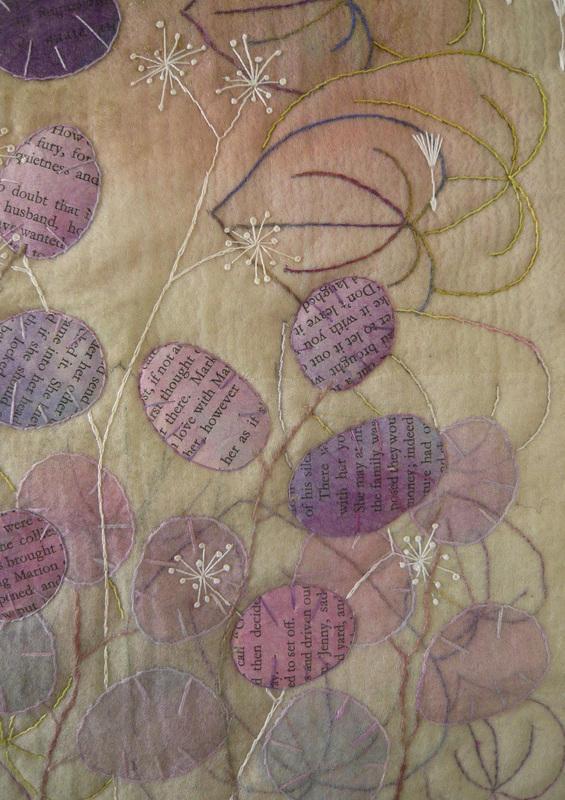 Seed heads II – Honesty – One of my ideas for the original piece was to have used only multiple layers of sheer fabrics, rather than the conventional quilt construction with wadding and backing, but this idea was ultimately discarded. For this piece I returned to the idea of sheer layers, but I decided to use them as part of a conventional construction, but to build up depth and layers of pattern with the layers. To do this, I started with a cream loose-weave cotton base, onto which I drew a border of leaf shapes, using a black pen. 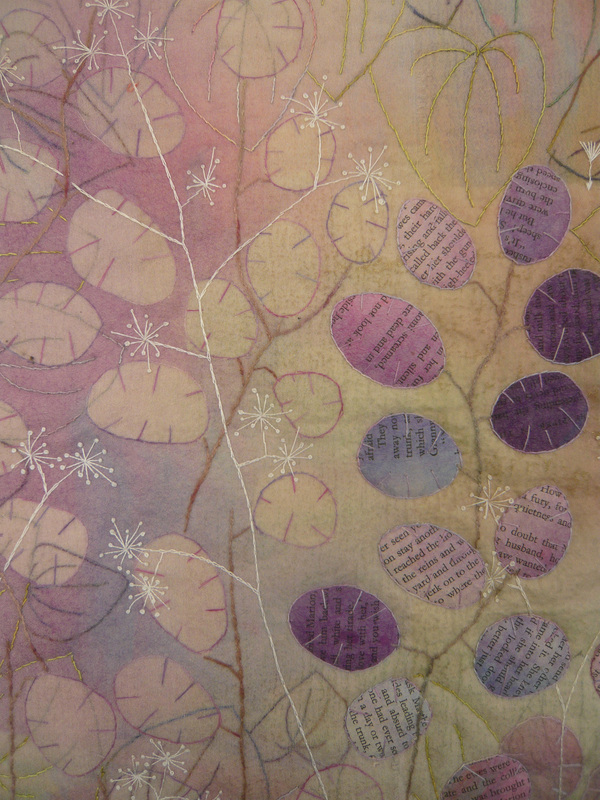 I then used transfer painted paper to colour a thin crepe sheer and fused this onto the backing using Bondaweb. 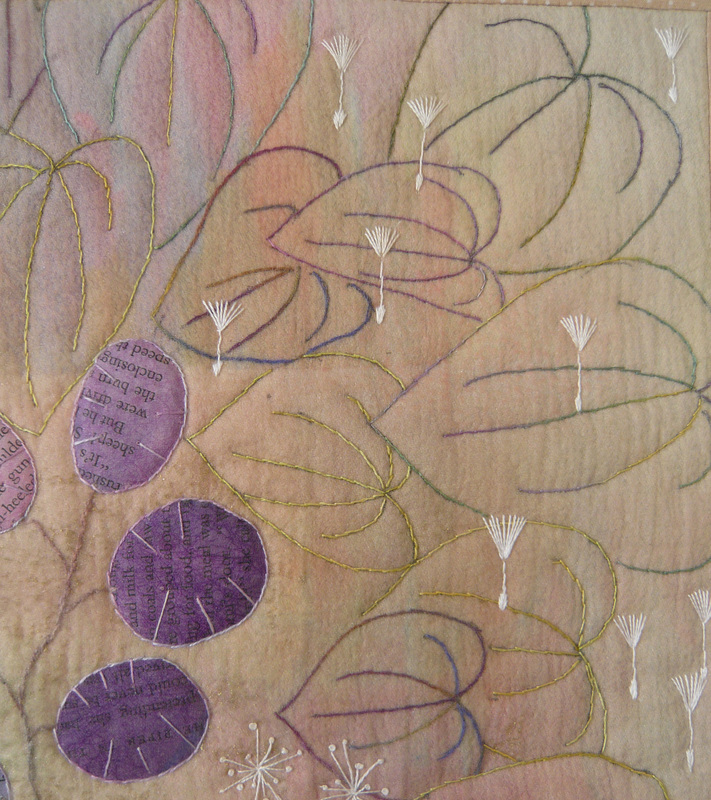 Onto this layer, I stitched around a random spread of some of the leaf shapes using stem stitch and a variegated thread. 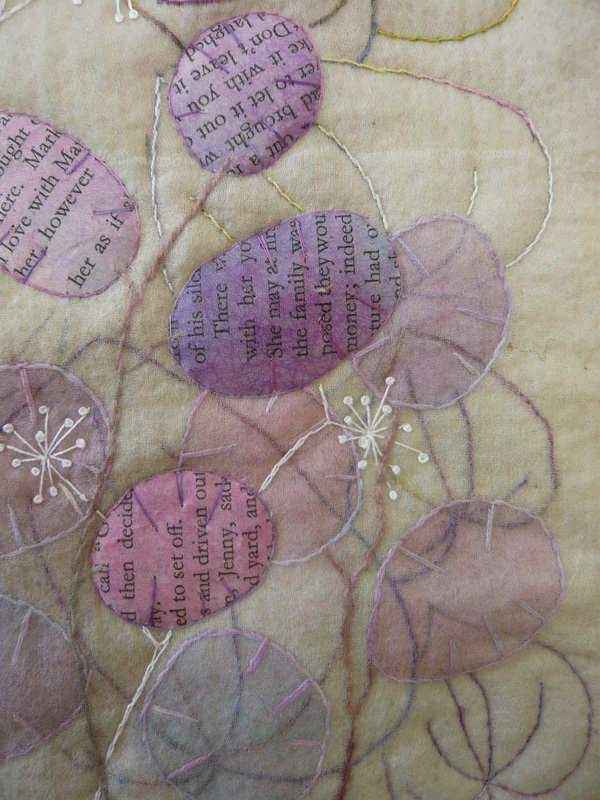 I then added coloured an irregular strip of white chiffon using transfer paint again, but this time I cut the shapes of Honesty seed heads form an old book, and used these as a resist to give the white shapes. This strip was laid on the left-hand side of the piece. I coloured a further white chiffon strip by printing with transfer paint using the paper shapes of the ‘resist’, and laid this strip at the bottom of the piece. Both chiffon strips were adhered with Mistyfuse. 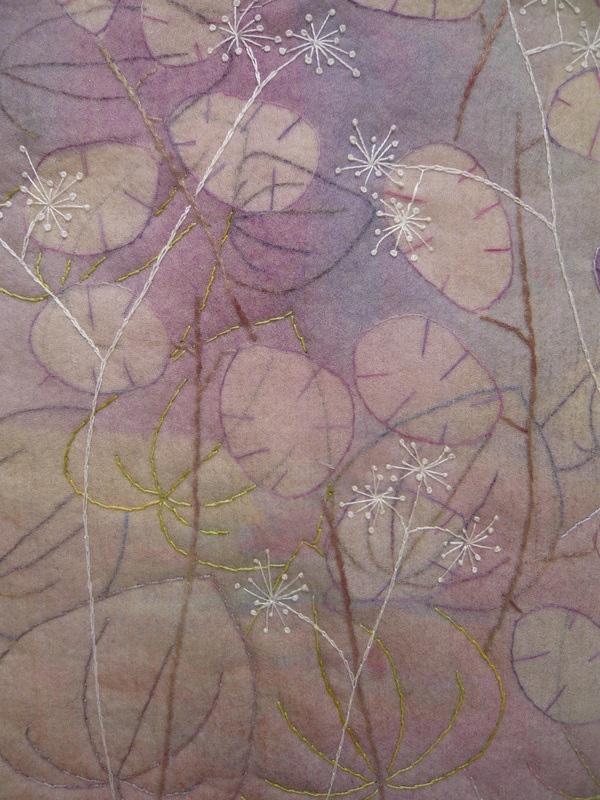 I now stitched around each seed head and added their details using stem stitch and a variegated toning silk thread. I added the stalks of the plants using stem stitch again, and a thicker brown/grey thread. My next layer consist of using the paper ‘resist’ shapes themselves, laid straight onto the piece. I fixed these in position with a tiny blob of ModPodge, before adding the stalks of the seed heads with the same brown/grey thread and stem stitch. I then used stem stitch to stitch over a few more of the leaf shapes in the border. At this point I added the wadding and backing, so that any further stitching would not only act as the quilting, but would give depth to those areas. My final layer was then completed by adding a layer of pale chiffon over the whole piece, using Mistyfuse again. 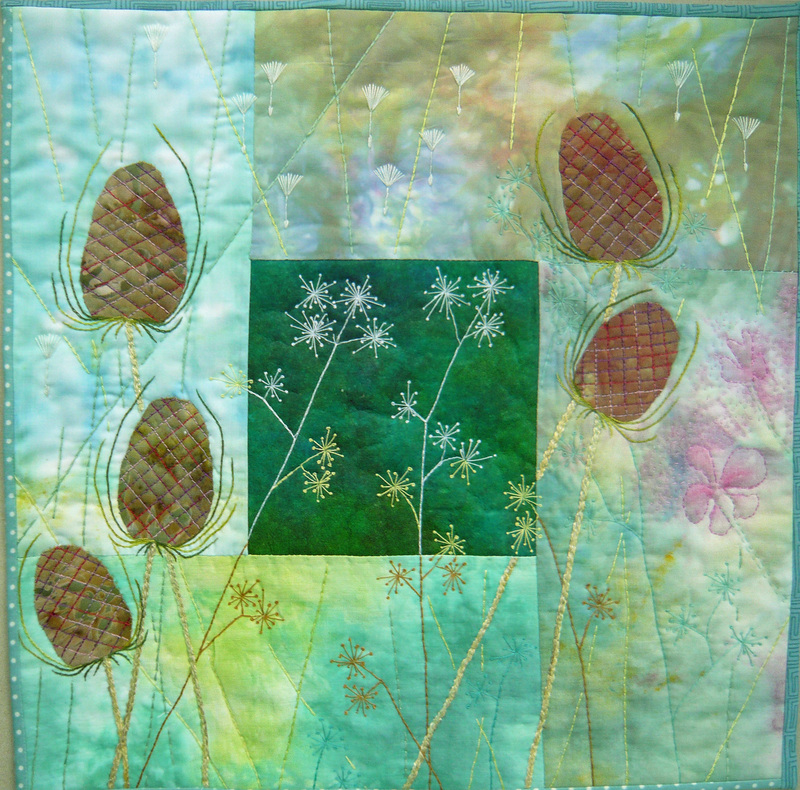 In this layer I then used stem stitch to stitch around the paper seed heads and add their detail using the variegated silk thread, and complete the remaining leaf shapes using both variegated and green threads. When completing the leaves, I did not stitch inside the seed heads when these were on top of the leaf-shapes, so that it gives the impression of the Honesty plants being viewed in the foreground and the leaves in the background. I then added dandelion seeds and Sweet Cicely seed heads is white. I wanted to include these, as they were also part of the original quilt design, and as well as adding interest and detail to the piece, they therefore provide a thread of consistency which I hope to continue throughout the series. This piece is completely hand-stitched, and mainly uses transfer paint to depict the design. I am hoping that for the remaining pieces in the series I will be able to explore different techniques, and I am very much looking forward to this. Joan, this piece is so wonderful! The colors and the design are perfect. The use of different techniques and materials make this quilt stunning. Looking forward seeing the next one. Beautiful piece. I love hand-stitched! I look forward to seeing more from your series. Awesome. I love this piece. Colors, design, transparency, everything is beautiful! This is lovely Joan and I really look forward to seeing your series..
What a lot of layers you made, and what a beautiful combinations you created. I love the subject you choose for the series, and the way you designed it. Good thinking about how you will work out the series, it makes me curious to see the next pieces. Well done. A beautiful, subtle design and interesting techniques used for construction. Seed heads is certainly a diverse subject so a good series choice. A beautiful piece Joan. I love the layers, the transparencies, the hand stitching.